Tokyo Bay Aqua-Line is one of the express-ways which connect Kawasaki, Kanagawa and Kisarazu, Chiba. 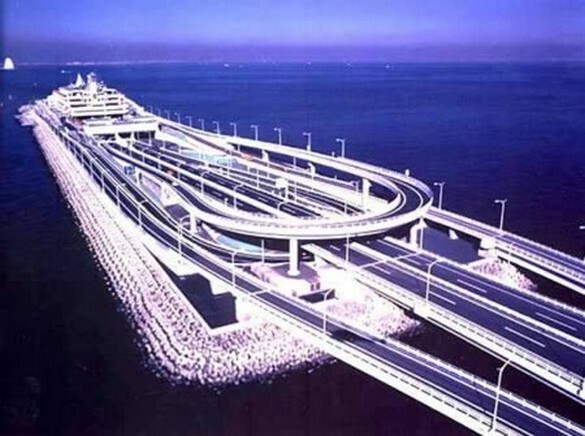 It is the crossing bay highway made by the underwater tunnel and the bridge. The Aqua-Tunnel is 9.6 km and starts in Kawasaki. At the connection of the tunnel and the bridge, there is a huge artificial island called Umi Hotaru. 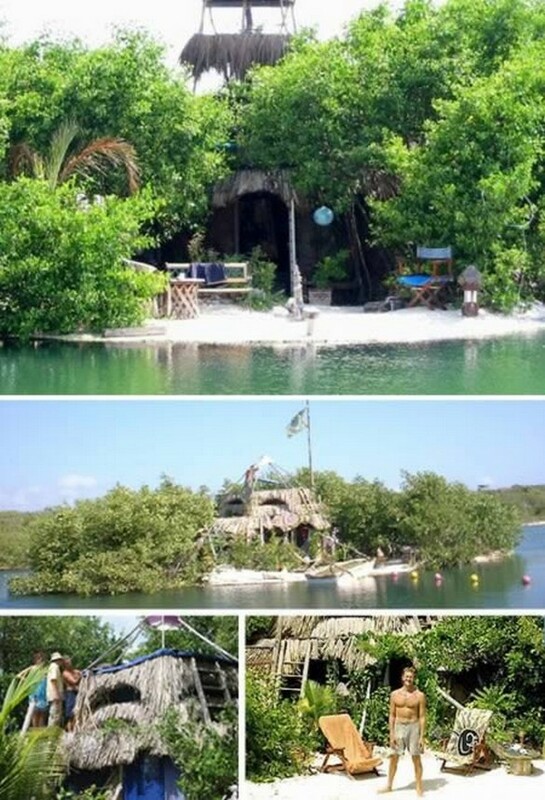 If you can't afford to buy your own tropical island paradise, why not build your own? That is exactly what Richie Sowa did back in 1998, using over a quarter-million plastic bottles. His SpiralIsland, destroyed years later by a hurricane, sported a two-story house, solar oven, self-composting toilet and multiple beaches. Better yet, he has started building another one! What's his ultimate goal? He wants to make the island bigger and bigger and finally float out to sea, traveling the world from the comfort of his own private paradise. 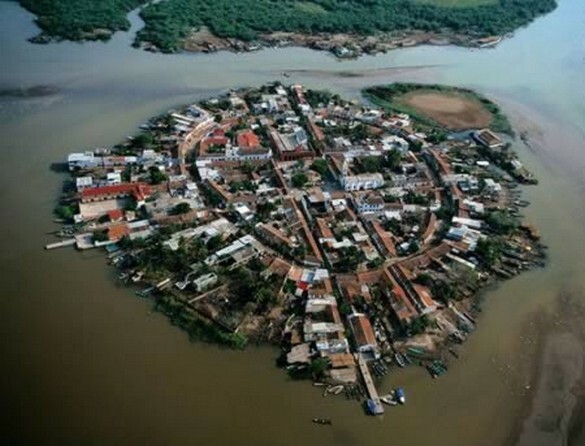 Mexcaltitán is a small man-made island-city off the coast in the Mexican state of Nayarit. Legend has it that it was the Aztlan of the Aztecs, their home city and birthplace from which they set out on their pilgrimage in 1091 that led them to the founding of Tenochtitlan. This island is now being promoted as a tourist attraction and has been designated a "Pueblo Magico" by the federal government. It is accessible by boat from La Batanza, which is the docking area located some 40 kilometers from Santiago, Ixcuintla. 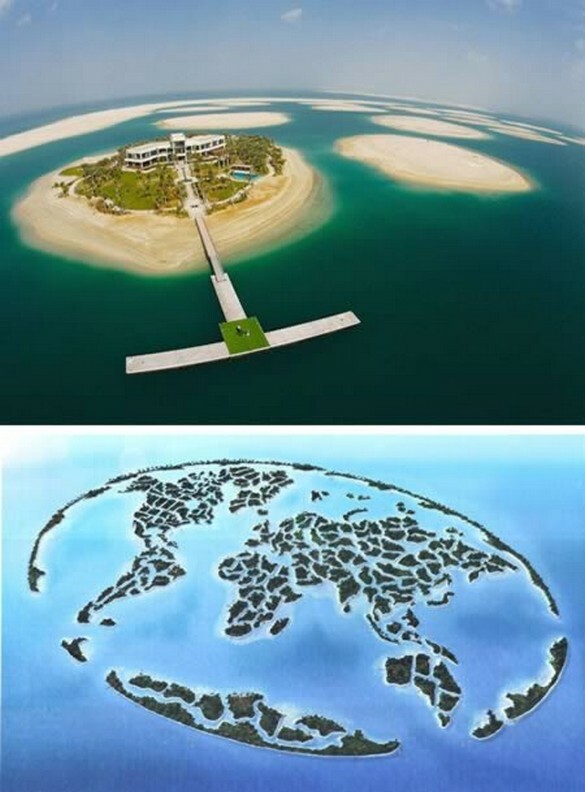 The World Islands project is a group of about 300 man-made islands, an artificial archipelago constructed in the shape of a map of the world located about 6 km off the coast of Dubai, UAE, covering an area of about 55 sq km. The master developer is Nakheel Properties, a subsidiary of the Dubai Government owned Dubai World conglomerate. 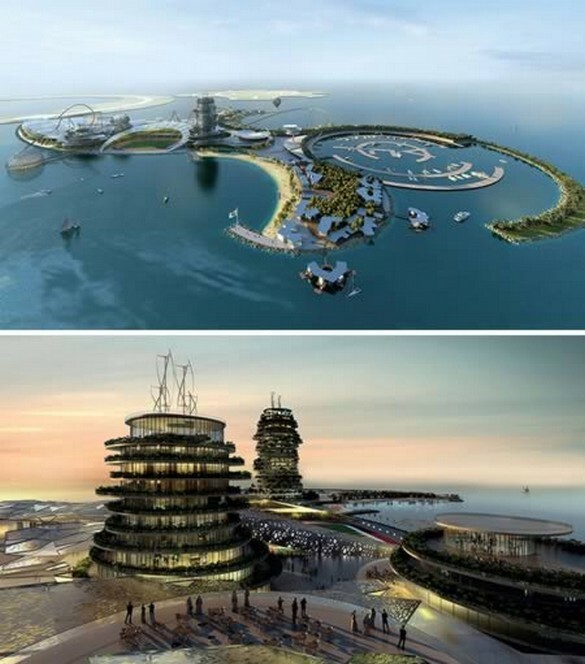 The luxurious "Royal Island BeachClub" was the FIRST island on the spectacular "The World" project to open its shores to the public on Lebanon Island recently, offering travelers and visitors an unimaginable and unforgettable experience that is not to be missed, being among the first to offer a most remarkable view of the skyline of the new and modern Dubai from the World Islands. The Khazar Islands (Azerbaijani: Xəzər adaları), also known as the Caspian Islands, are 41 artificial islands 25 km (16 mi) south of Baku, Azerbaijan, extending 3,000 hectares (about 11.6 sq mi) over the Caspian Sea. Avesta, the company responsible for the islands' development, is constructing the city to house 1 million residents, contain 150 schools, 50 hospitals and daycare centers, numerous parks, shopping malls, cultural centers, university campuses, a Formula 1 quality racetrack, and the Azerbaijan Tower (expected to be the tallest in the world). 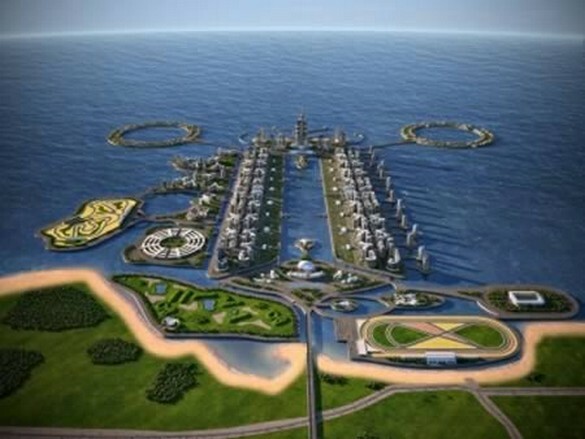 The $2 billion tower is to be the centerpiece of the Khazar Islands, a $100 billion city. It's been called a “man-made island fit for a Bond villain,” and it's easy to see why. No Man'sLand Fort, located off the coast of Britain, has a forbidding exterior with its towering armor-plated granite and steel walls. The Victorian-era sea fort was originally built to fend off attacks by the French navy, but is now a luxury hotel with 21 rooms, two helipads and a heated indoor swimming pool. It was put up for sale in 2007 but the company collapsed, leading to some drama with its former owner Harmesh Pooni, who barricaded himself inside in 2008. It still has not been sold. Do you crave the seclusion of your own private island, but hate being tied down in one place? 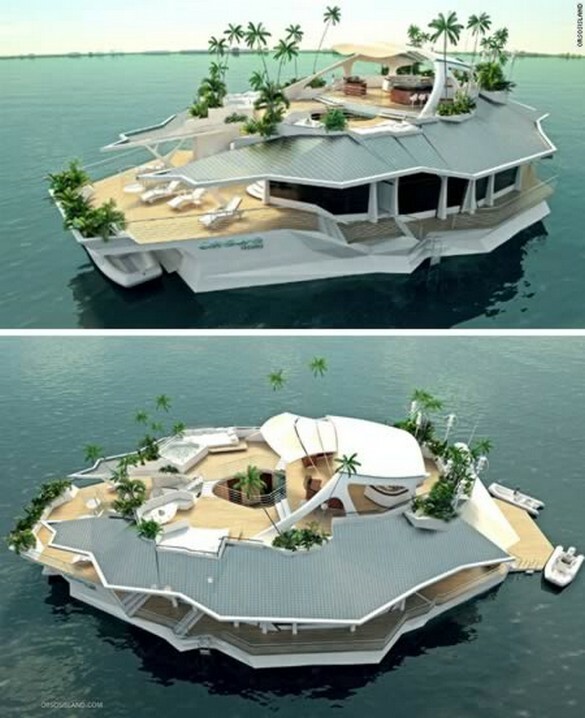 If so, an Austrian firm has developed the solution to your troubles: a man-made floating "island,"complete with two small diesel engines for whenever you fancy a change of scenery. The oval-shaped "Orsos Island" has been designed to combine the mobility of a yacht with the comfort of a house. It offers six bedrooms, spread over three floors and 1,000 square meters, and nearly four tennis courts -- a worthy luxury living space. The price tag for all of this is certainly more than you'd expect to pay for a mainland mansion but, at $6.5 million, it falls well below the average cost of the gigayachts and Caribbean islands currently favored by the fabulously wealthy. In 2012, Spanish soccer super-team Real Madrid announced plans to construct a $1 billion luxury resort in the United Arab Emirates – and to ensure a truly unique location, the sports company plans to construct an archipelago of artificial islands upon which it will be located. The resort, which has also been described as a theme park for the soccer obsessed, will include two high-rise hotels, luxury villas, a 10,000-seat ocean-side football stadium, a marina, and a hi-tech museum devoted to the history of the Team. Real Madrid have announced that the 430,000 square meter project was designed by J+H BOIFFILS and will be constructed in partnership with the UAE government. They hope to open by 2015.